Whether you're planning on having cool, crisp slices on your summer salads, or you want to put away some snappy pickles, planting cucumbers is a popular and inexpensive way to get your vegetables. Cucumbers can be grown in the smallest of garden plots, using trellis and fence-growing methods. Even container gardeners can enjoy picking fresh cucumbers throughout the summer, thanks to smaller varieties being grown. No matter the size, cucumbers are relatively carefree and generally easy to grow for even a beginning gardener. Plant seeds in warm soil after all chance of frost has passed for your area. You can check for your local frost date by using the Farmers' Almanac, at farmersalmanac.com, or checking local extension services. Mix in compost with the top 6 inches of soil in your planting area. Plant three seeds together, about 1 inch deep. Plant each group of seeds about 1 foot away from the other ones in the row. When the seedlings have two sets of leaves, clip off two and leave the strongest. Install a trellis or other system for vines to climb upon. Bury the trellis legs deeply to minimize the chance of it falling over from the weight of the plants later in the season. Place black plastic mulch around the plants during the early spring. This mulch will help to warm the soil, and will give your crops a head start in producing a harvest. Water cucumbers regularly. Cucumbers require 1 to 2 inches of water per week. When the vines have fruits on them, water more to help prevent the cucumbers from becoming bitter. Fertilize the plants with a side dressing of compost when they start to develop runners. Side dressing is working the compost into the soil, right next to the main stem of the plant. This will give the plants an extra boost to help them vine up your trellis or fence. 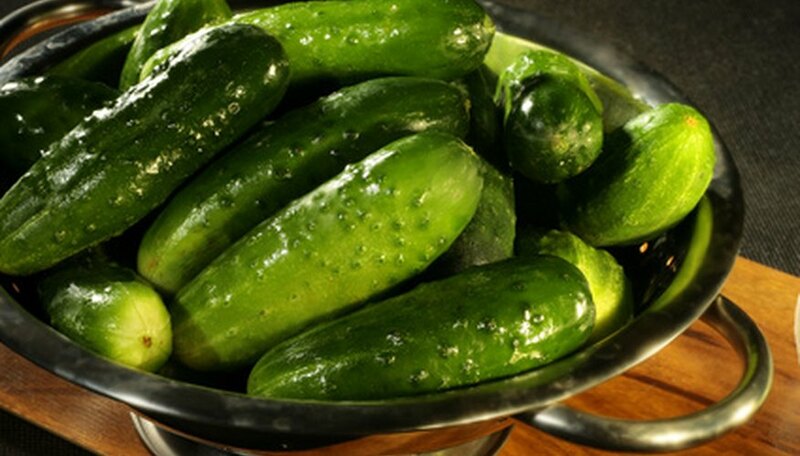 Pick cucumbers when they are full sized and have smooth skins, but don't wait until they are over-sized. Overly large cucumbers have more seeds and may not taste as good. Pick cucumbers every two to three days to encourage the plants to keep producing. When the vines are beginning to grow up the trellis, you may have to train them. Wind them gently around the support and tie them with old nylons or strips of fabric.